Would you prefer a black, low cut nursing bra? 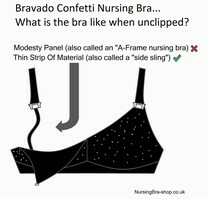 If so, then we recommend the Bravado Confetti Seamfree nursing bra. We think you will find it incredibly comfortable and yet really feminine too. So why should you find it so comfortable? Well, it is made from a super-soft, lightweight fabric which is also stretchy. This means that as your size changes during your breastfeeding months, the bra will stretch and contract to fit your body perfectly. Do you sometimes get irritated by the washing tags you find in the back of bras? If so, then you may love the fact that this bra has no tags and even has the washing instructions printed on the inside of the bra! The seamless construction of this bra also means that you won't get any rubbing from seams you may get in other nursing bras. 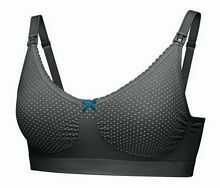 So what makes this bra so pretty? Well, it has a Swiss-dot pattern on the cups, and it also features a lovely bow. We think that the fact that this bra also has a lace trim will make you feel really feminine. Bravado have also made it easy to pick the right size for you. This bra comes in just four sizes (Small, Medium, Large and Extra-Large). These sizes cover several cup sizes, and it also means that as your body changes, the bra should still fit really comfortably. Please see the table below to pick the right size. The Confetti nursing bra has a V-neck low cut style. Did you know that breastfeeding advisors suggest that, if possible, you should choose a bra that does not have underwires during your nursing months? So, you may be pleased to know that this bra is wire-free. How about the cups? Well, the cups fully drop down, which will give your baby full skin-to-skin contact, which is also recommended by breastfeeding experts. The nursing clips lie flat and are very easy to open using just one hand. This means that you won't need to fumble around whilst holding your baby in your other arm. The fabric of the bra is 75% nylon, 16% polyester and 9% spandex (excluding the elastic). Overall, this gives you a nursing bra that is really supportive and allows the bra to mould to your body to help it remain really comfortable. This nursing bra can also be worn in the months before you give birth, meaning you get even better value for money. This bra is also available in a fawn or plum colour....please see below for these options. 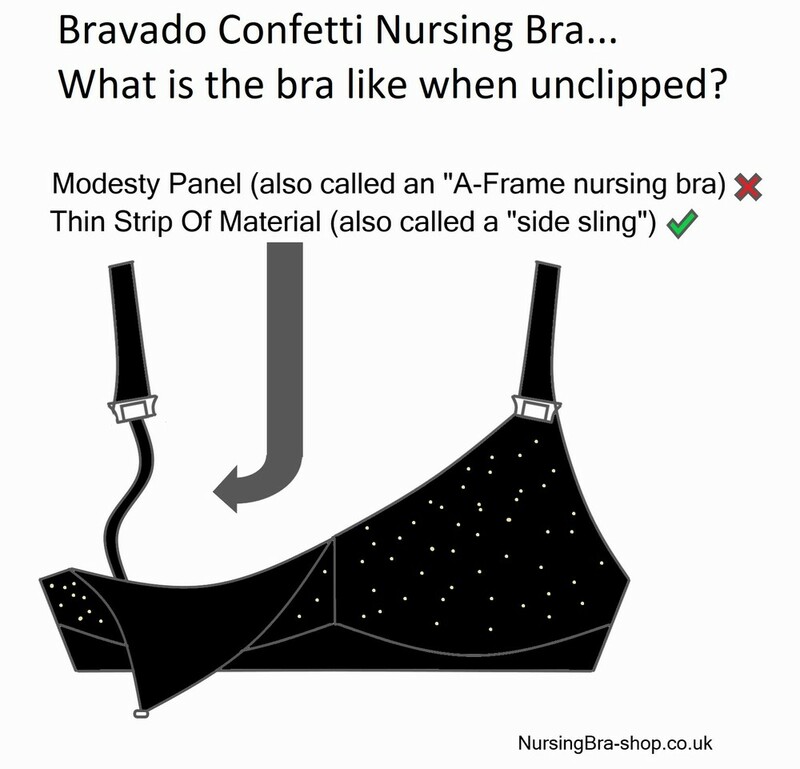 So why do we think you should choose the Bravado black Confetti breastfeeding bra? We think it is perfect if your are looking for a low-cut nursing bra. You should also find it incredibly comfortable and pretty too.